Small shots of chocolate and tropical fruits jelly, layered up with vanilla coconut yoghurt and banana slices. So good! And ready in less than 5 minutes. Big thanks to Naturelly Jelly, who provided the jelly and contributed to the cost of creating this post. This post also contains affiliate links, which help to support the blog. Thanks for your support! I never knew you could make so many different things with jelly. Especially dairy-free, vegan jelly like this one. 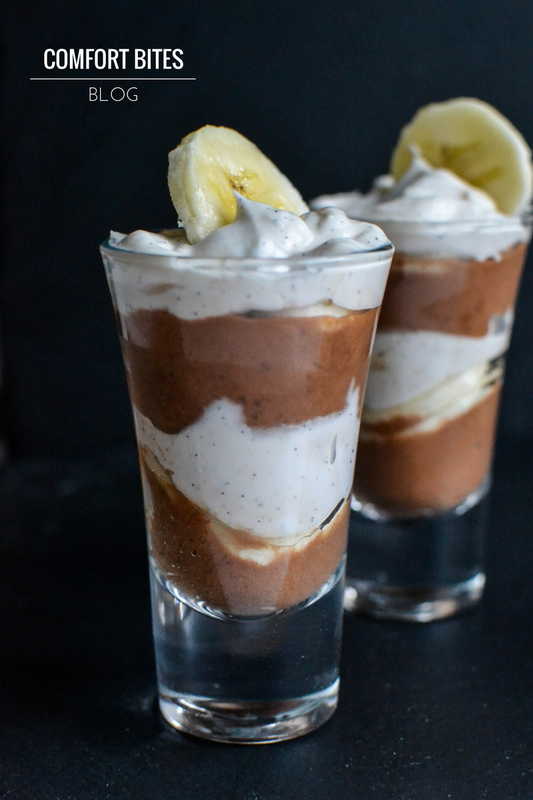 You can stir it into yoghurt and top with granola, turn it into ice lollies and sundaes and you can mix it up with chocolate and turn it into a kind of sweet, wobbly chocolate mousse. Jelly. Who knew? 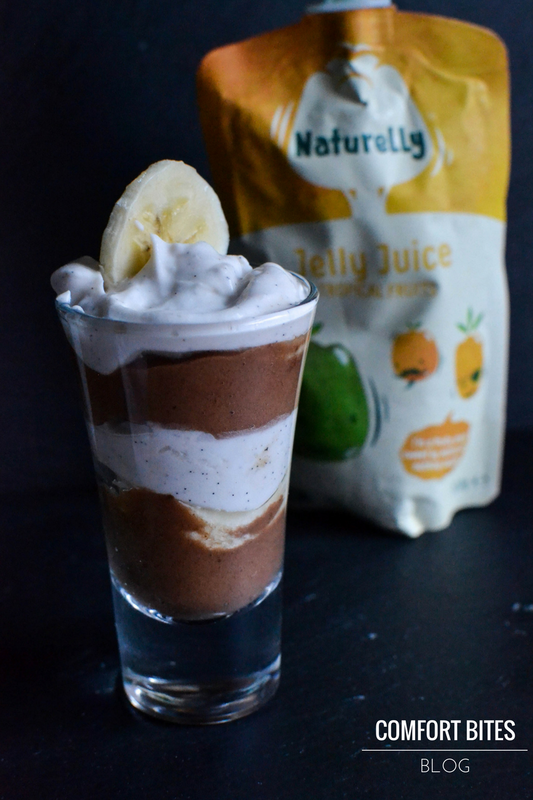 The great thing about this Naturelly Jelly is that it's not loaded with refined sugars and it's made from part of the lily plant, which is where the jelly bit comes from - so totally plant based. They've also won loads of awards too, not to mention the fact that they're darn tasty. You can literally make these desserts in under 5 minutes. You'll need a blender or stick blender to whip up the cacao and the jelly - and the rest is just a quick stir and layering into the glass. First, peel and slice your fresh banana and put it to one side. Break up the frozen banana with your hands and drop into a jug or blender jug. Squeeze in the pouch of Naturelly Jelly and blend it until smooth. You should have a glossy, wobbly chocolate mousse. Next, get out the coconut yoghurt and stir in the vanilla bean paste. Now, layer up the puds. Get out 4 shot glasses, or similar sized glasses, and, using a teaspoon, spoon a little of the chocolate jelly mixture into the base of the glass. 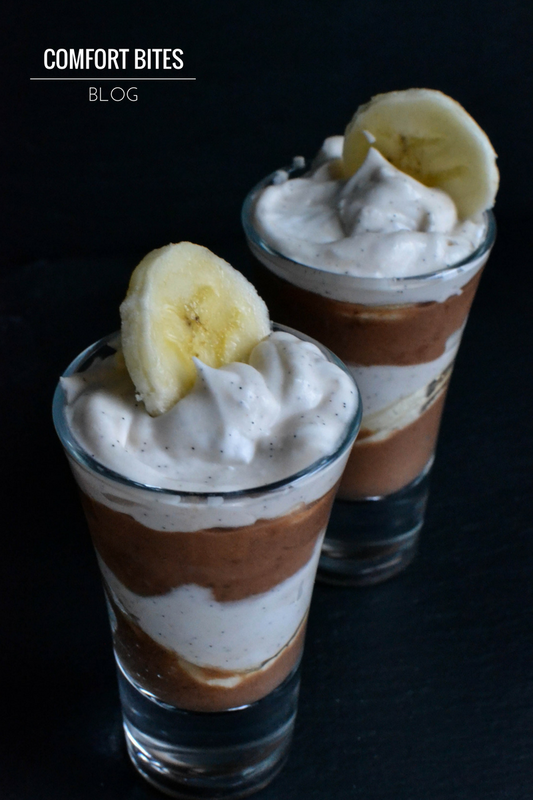 Push in a banana slice or two and then top with a spoonful of the coconut yoghurt. Push in another banana slice and then spoon in chocolate jelly and coconut yoghurt as before. Keep going, until you reach the top of the glasses, where you finish with a swirl of coconut yoghurt. Push in a banana slice and it's ready to serve!